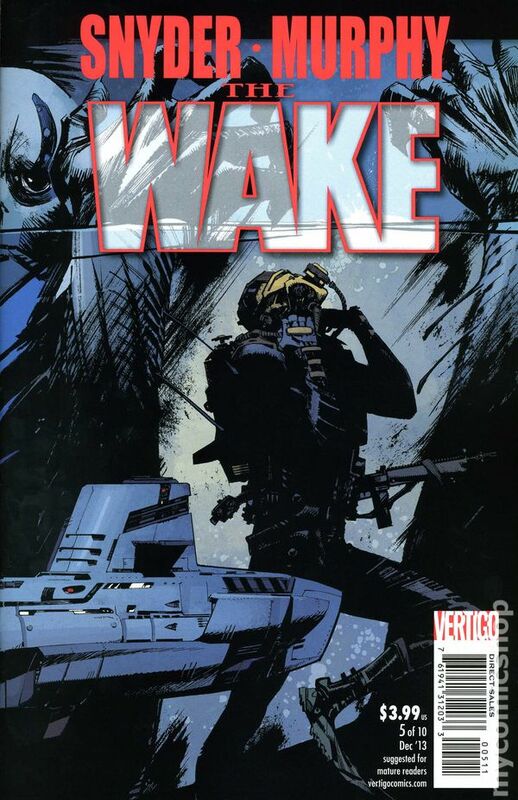 Cover by Sean Murphy (W) Scott Snyder (A) Sean Murphy THERE'S SOMETHING DOWN THERE...' When Marine Biologist Lee Archer is approached by the Department of Homeland Security for help with a new threat, she declines, but quickly realizes they won't take no for an answer. Soon she is plunging to the depths of the Arctic Circle to a secret, underwater oilrig where they've discovered something miraculous and terrifying... Writer Scott Snyder (BATMAN, AMERICAN VAMPIRE) and artist Sean Murphy (PUNK ROCK JESUS) bring their acclaimed talents to this sci-fi/horror epic that explores the horrors of the deep, probes the origins of human history, and leaps far beyond to a frightening future. Cover price $2.99. Limited 1 for 25 Variant Cover by Adam Kubert (W) Scott Snyder (A) Sean Murphy THERE'S SOMETHING DOWN THERE...' When Marine Biologist Lee Archer is approached by the Department of Homeland Security for help with a new threat, she declines, but quickly realizes they won't take no for an answer. Soon she is plunging to the depths of the Arctic Circle to a secret, underwater oilrig where they've discovered something miraculous and terrifying... 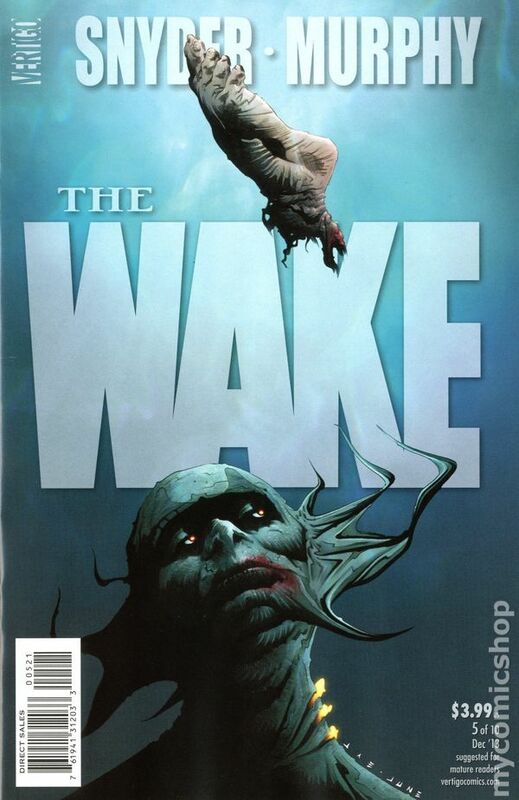 Writer Scott Snyder (BATMAN, AMERICAN VAMPIRE) and artist Sean Murphy (PUNK ROCK JESUS) bring their acclaimed talents to this sci-fi/horror epic that explores the horrors of the deep, probes the origins of human history, and leaps far beyond to a frightening future. Cover price $2.99. Second Printing Variant Cover by Sean Murphy (W) Scott Snyder (A) Sean Murphy THERE'S SOMETHING DOWN THERE...' When Marine Biologist Lee Archer is approached by the Department of Homeland Security for help with a new threat, she declines, but quickly realizes they won't take no for an answer. Soon she is plunging to the depths of the Arctic Circle to a secret, underwater oilrig where they've discovered something miraculous and terrifying... Writer Scott Snyder (BATMAN, AMERICAN VAMPIRE) and artist Sean Murphy (PUNK ROCK JESUS) bring their acclaimed talents to this sci-fi/horror epic that explores the horrors of the deep, probes the origins of human history, and leaps far beyond to a frightening future. Cover price $2.99. 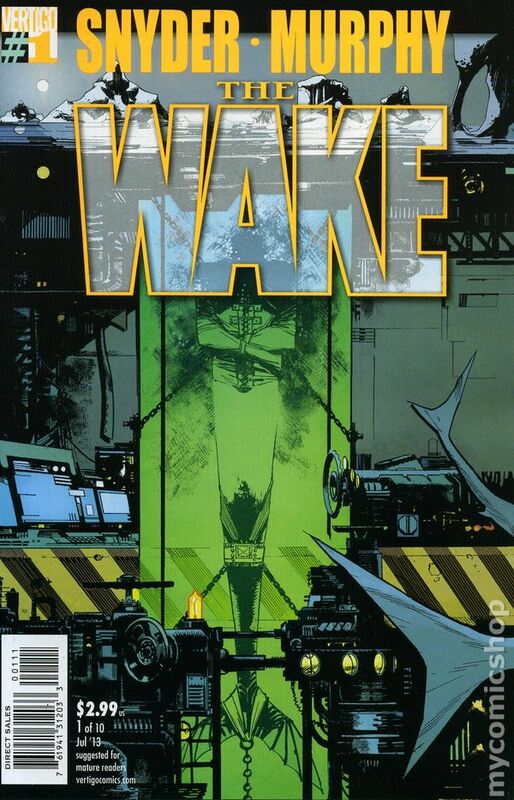 Cover by Sean Murphy (W) Scott Snyder (A) Sean Murphy They call it the 'Ghost Rig.' A secret, underwater oil rig filled with roughnecks and scientists on the brink of an incredible discovery. But when things go horribly wrong, this scientific safe haven will turn into a house of horrors at the bottom of the ocean! Part two of the incredible new series by Scott Snyder and Sean Murphy! Cover price $2.99. Limited 1 for 25 Variant Cover by Lee Bermajo (W) Scott Snyder (A) Sean Murphy They call it the 'Ghost Rig.' A secret, underwater oil rig filled with roughnecks and scientists on the brink of an incredible discovery. But when things go horribly wrong, this scientific safe haven will turn into a house of horrors at the bottom of the ocean! 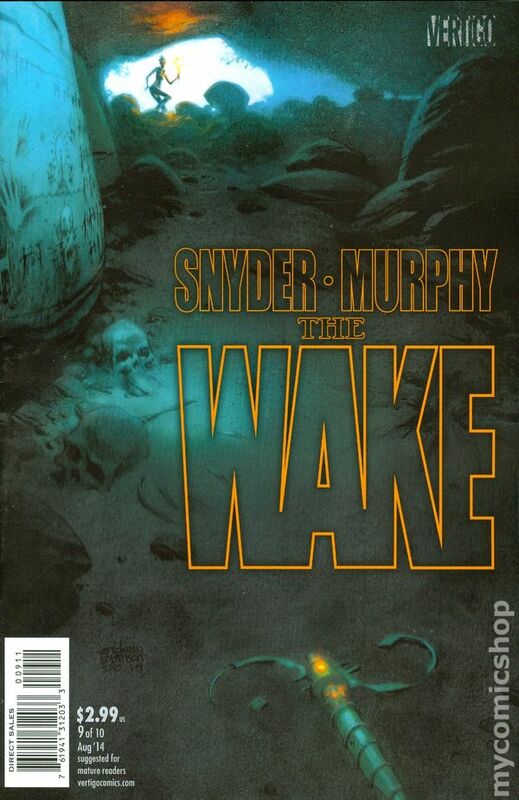 Part two of the incredible new series by Scott Snyder and Sean Murphy! Cover price $2.99. Second Printing - Cover by Sean Murphy (W) Scott Snyder (A) Sean Murphy They call it the 'Ghost Rig.' A secret, underwater oil rig filled with roughnecks and scientists on the brink of an incredible discovery. But when things go horribly wrong, this scientific safe haven will turn into a house of horrors at the bottom of the ocean! 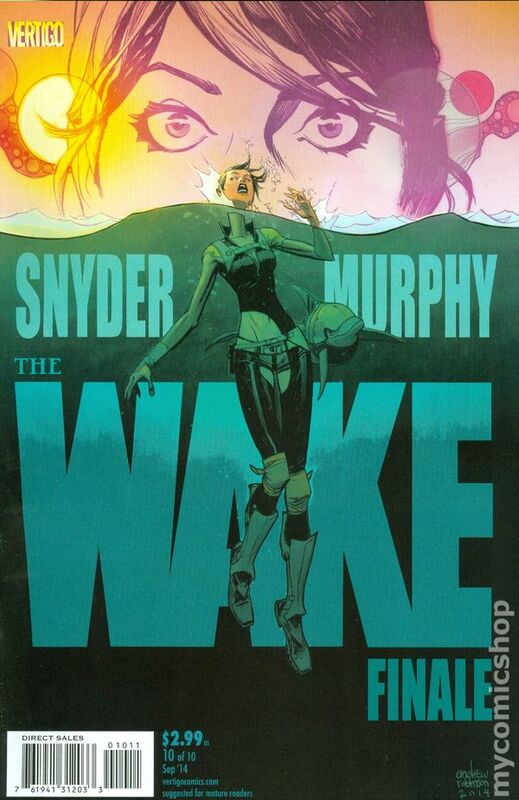 Part two of the incredible new series by Scott Snyder and Sean Murphy! Cover price $2.99. 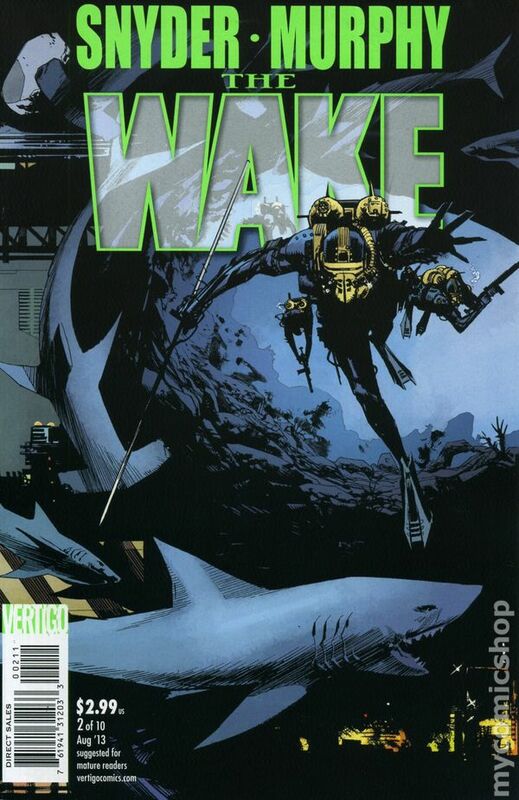 Cover by Sean Murphy (W) Scott Snyder (A) Sean Murphy A new species has been discovered at the bottom of the ocean, and as a result people are dying. Is it the missing link? Or a link to something even bigger? Marine biologist Lee Archer and her crew have to find out before things get much, much worse... Cover price $2.99. 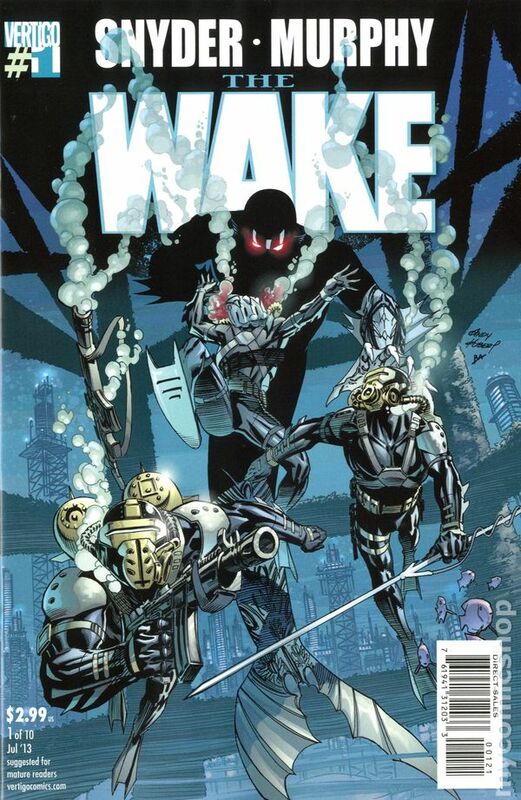 Limited 1 for 25 Variant Cover by Sean Murphy (W) Scott Snyder (A) Sean Murphy A new species has been discovered at the bottom of the ocean, and as a result people are dying. Is it the missing link? Or a link to something even bigger? Marine biologist Lee Archer and her crew have to find out before things get much, much worse... Cover price $2.99. 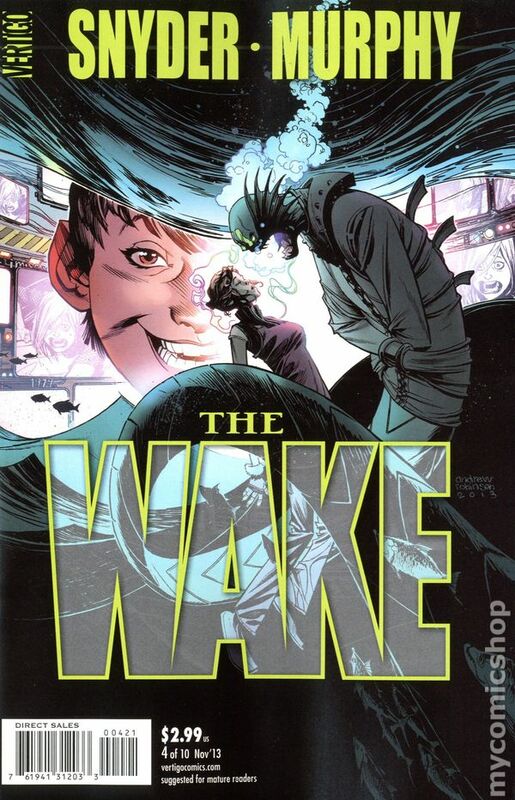 Cover by Sean Murphy (W) Scott Snyder (A) Sean Murphy Trapped...drowning...dying...could things get worse for Doctor Lee Archer and her team? Yes, they could. Much worse, in fact. Turns out the shocking discovery of the creature was only the beginning. Vertigo's hit new series continues! Cover price $2.99. Limited 1 for 25 Variant Cover by Sean Murphy (W) Scott Snyder (A) Sean Murphy Trapped...drowning...dying...could things get worse for Doctor Lee Archer and her team? Yes, they could. Much worse, in fact. Turns out the shocking discovery of the creature was only the beginning. 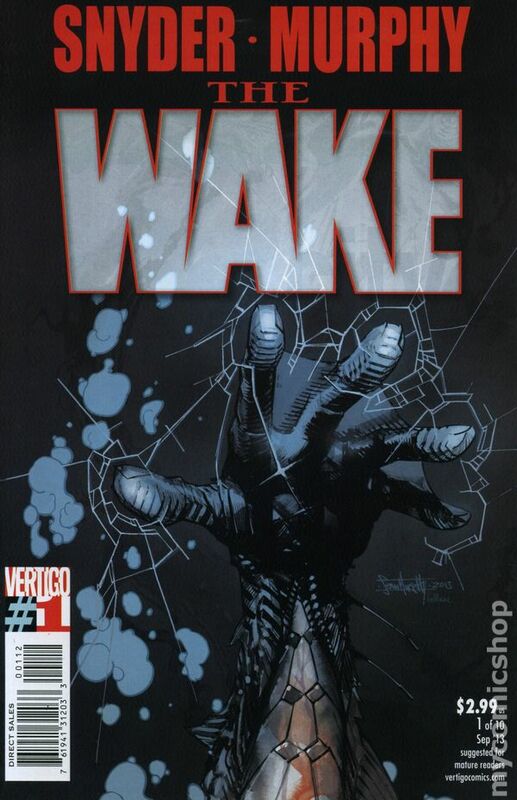 Vertigo's hit new series continues! Cover price $2.99. 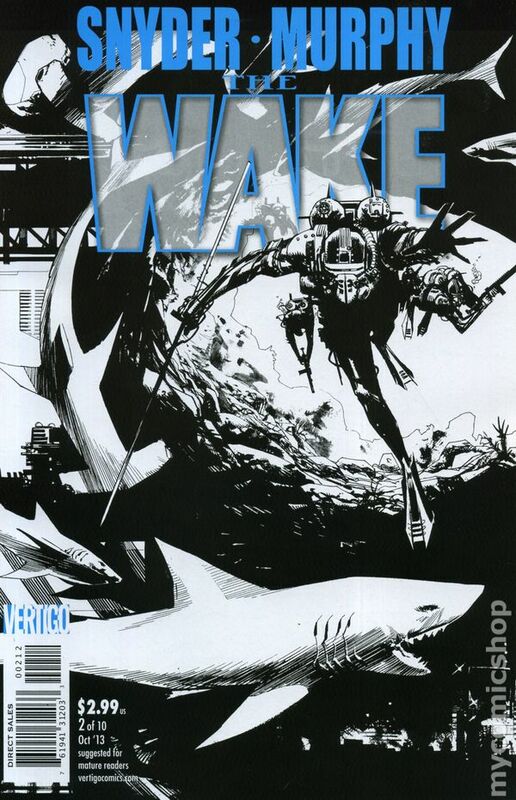 Cover by Sean Murphy (W) Scott Snyder (A) Sean Murphy There have been hints that Lee Archer's struggle at the bottom of the ocean will have much, much bigger ramifications. A flooded future...an impact on evolution...and more. Now, we finally find out. 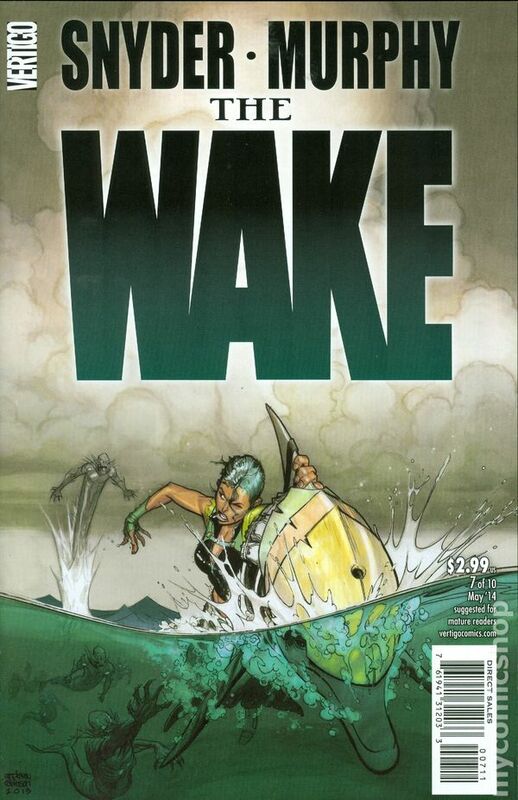 If you think you know what THE WAKE is about, this issue changes everything. Cover price $3.99. 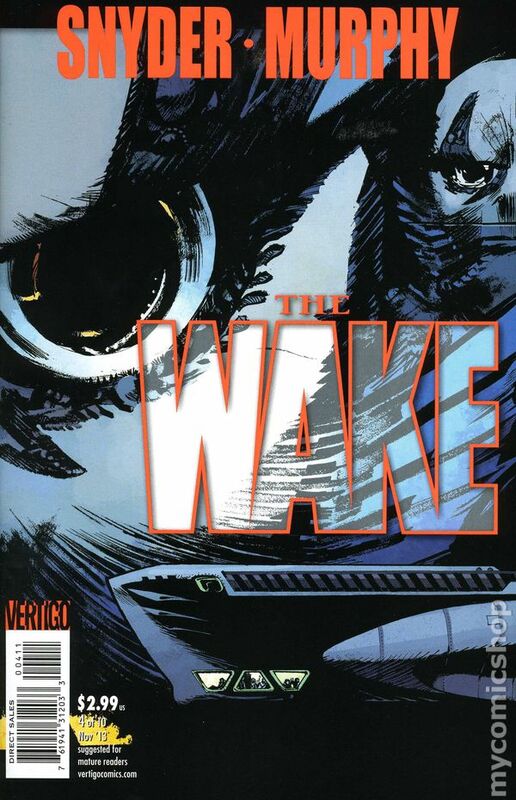 Limited 1 for 25 Variant Cover by Jae Lee (W) Scott Snyder (A) Sean Murphy There have been hints that Lee Archer's struggle at the bottom of the ocean will have much, much bigger ramifications. A flooded future...an impact on evolution...and more. Now, we finally find out. 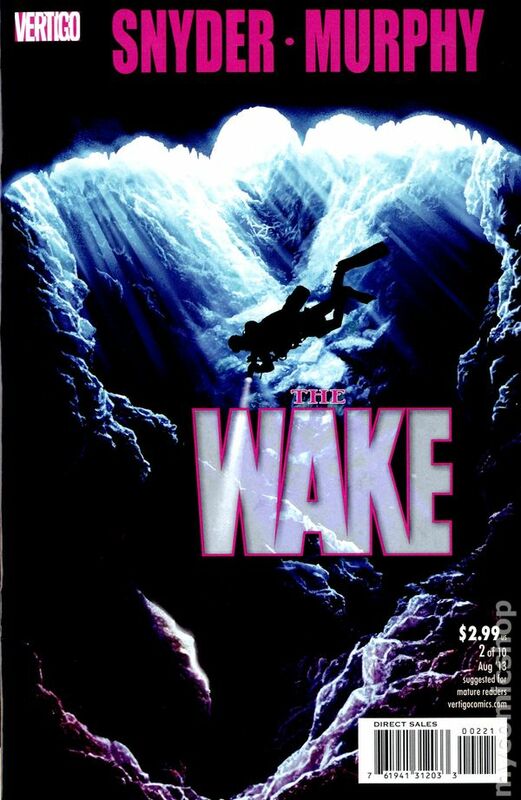 If you think you know what THE WAKE is about, this issue changes everything. Cover price $3.99. (W) Scott Snyder (A) Sean Murphy (CA) Andrew Robinson 'My name is Leeward, and this is where my story begins...' Our story jumps two hundred years into a flooded future where nothing is the same. 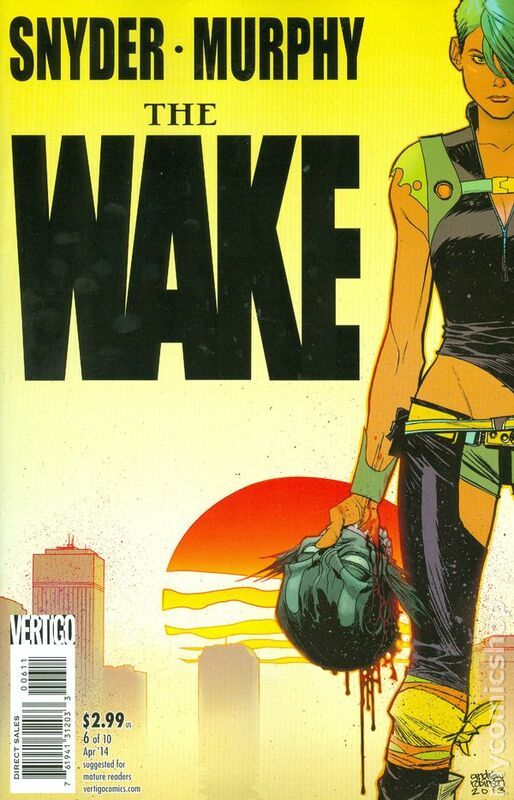 The second half of THE WAKE starts here! Cover price $2.99. (W) Scott Snyder (A) Sean Murphy (CA) Andrew Robinson Two hundred years in the future, things are not looking good for the human race. But a mysterious call from the deep could change everything. 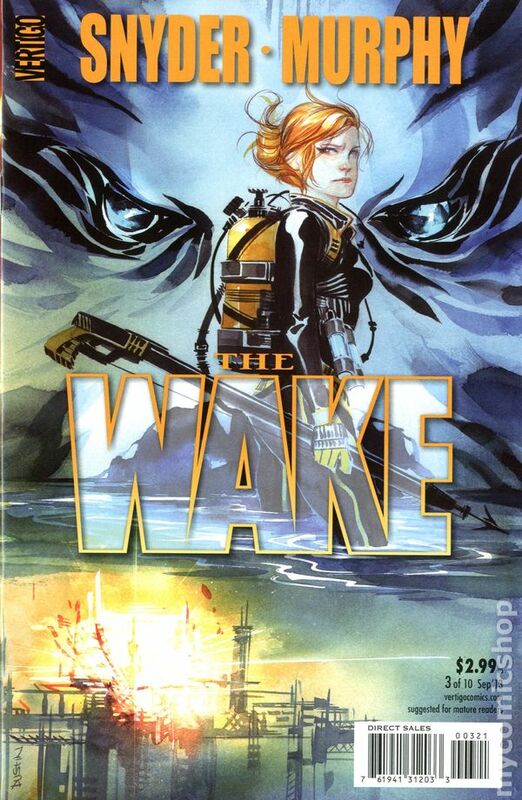 The epic, flooded future of THE WAKE continues here! Cover price $2.99. Written by Scott Snyder. Art by Sean Murphy. Cover by Andrew Robinson. They say don't go in the ocean. There are monsters out there. Terrible secrets in the deep. But Leeward isn't scared of any of that, because the thing she's running from on land is much, much worse… 32 pages, full color. Cover price $2.99. Written by Scott Snyder. Art by Sean Murphy. Cover by Andrew Robinson. 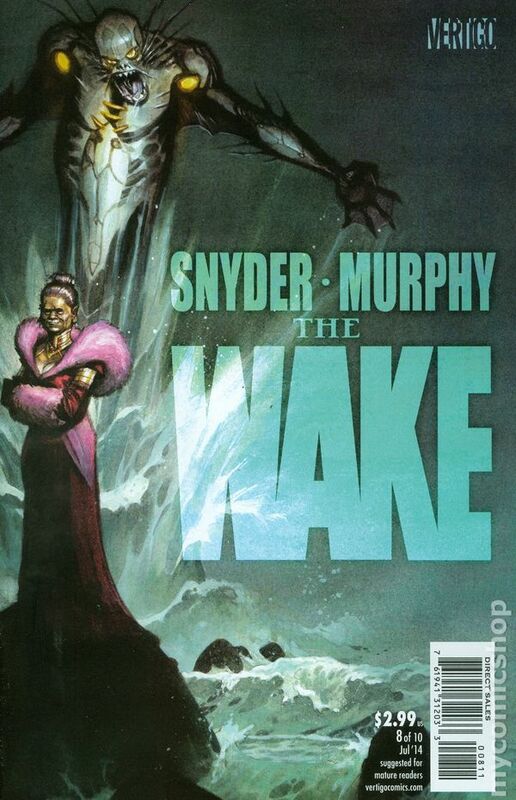 A post-apocalyptic USA only partially above sea level, a country overrun by corrupt leaders fearful of horrific mermaids, a voice dredged up from the deep, dark past - how will all these factors tie together in the acclaimed miniseries by Scott Snyder and Sean Murphy? Will Leeward discover something more to the life she knows out across the vast ocean? 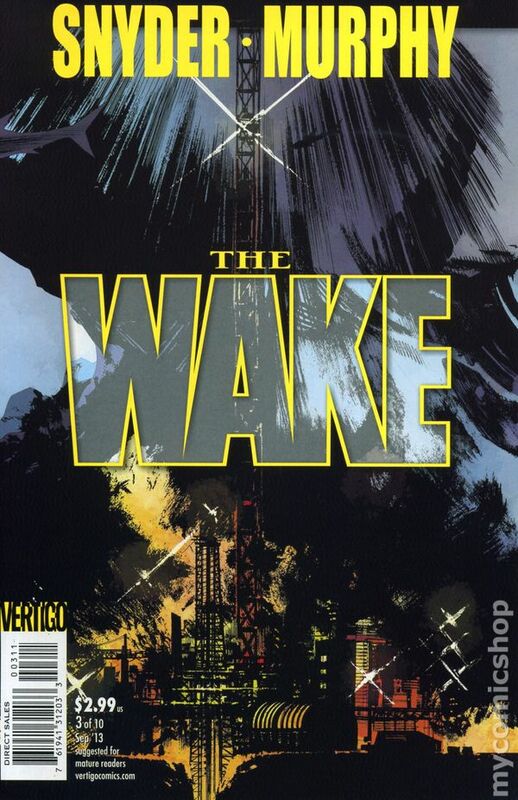 Find out in the penultimate issue of THE WAKE! 32 pages, full color. Cover price $2.99. Written by Scott Snyder. Art by Sean Murphy. Cover by Andrew Robinson. The series Buzzfeed called 'the best horror comic of the year' and Comics Alliance rated 'most unpredictable' and 'uncanny and uncategorizable' comes to a shocking conclusion. Will Leeward uncover a history buried thousands of leagues beneath the sea - or will the waves come crashing down on what little land is left? 32 pages, full color. Cover price $2.99.